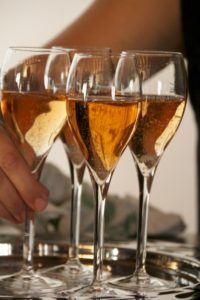 You will find below a sample itinerary for a corporate day trip to Champagne. A guide price for this trip is £20,857 (GBP). Your private flight on an Embraer Legacy jet will depart from your nearest airfield at approximately 08:30, and breakfast will be served on board. The flight time will be around one hour. Upon arrival at Vatry airfield, you will be met on the tarmac by a luxury chauffeured mini-coach and a Grape Escapes Tour Manager, who will accompany you throughout the day on a private basis. 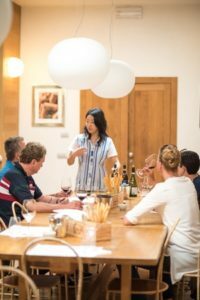 You will firstly be taken out into the vineyards where you will be welcomed as the guests of a small, family-run Champagne maker. As well as having a tour of the property and seeing first-hand the fascinating Champagne-making process from press to bottle, you will learn the Napoleonic art of Sabrage (the art of opening the Champagne bottle with a sword). Since you will each open a bottle you will then need to drink at least some of the Champagnes that have been opened. A six course lunch with a Champagne apéritif, wines, water and coffee will then be served in the double Michelin-starred restaurant, le Parc at the stunning Château les Crayères in Reims. After lunch, the afternoon will be spent in style at the estate of the prestigious Champagne Pommery. Here, you will have a private tour of the impressive 1600 year-old Gallo-Roman chalk cellars. Whilst wandering through the eleven miles of tunnels and galleries, home to more than twenty million Champagne bottles, you will learn all about the Champagne industry and the particularities of this world famous producer. The tour will conclude with a comparative tasting of three Pommery Champagnes. You will be taken back to Vatry airfield at around 18:30 in time for your return flight. A light dinner will be served on board. The guide price of £20,857 is based on 10 people and includes return private flights between your private nearest airfield and Vatry, a luxury chauffeured mini-coach and Grape Escapes Tour Manager for the day, tours and tastings at 2 Champagne Houses and lunch with drinks. Give us a call on +44 (0) 1920 46 86 66 or e-mail info@grapeescapes.net to start planning your corporate day trip with our team of experts.